It's crucial for teams to be able to capitalize on their opportunities. 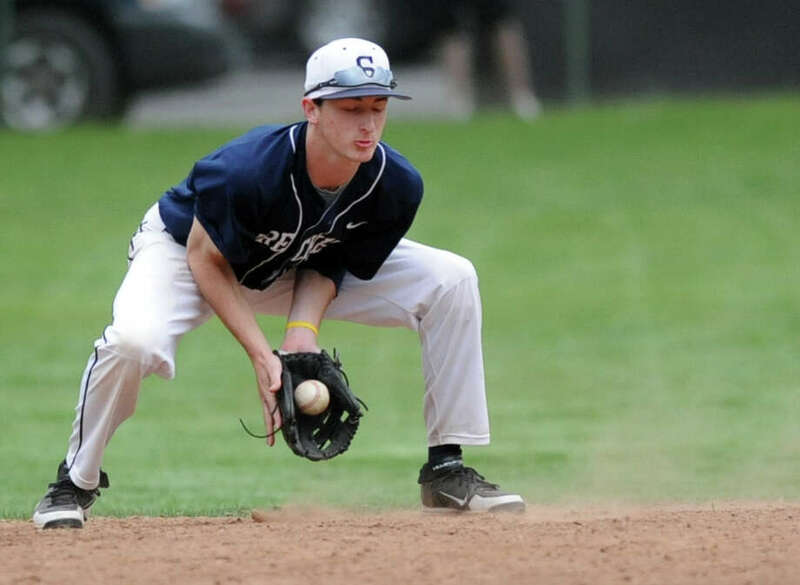 That was the difference in the Staples baseball team's 8-3 home win over Darien Wednesday. Staples took advantage of its chances and raised its record to 9-1, 7-1 in the FCIAC. Darien squandered its comeback opportunity and dropped to 3-8, 2-7. The Wreckers scored what proved to be the winning run in the bottom of the fourth inning to take a 4-3 lead. Moreover, they did it without getting a hit. Blue Wave senior righty Jon Dehlin walked and hit a batter with one out. Bryan Terzian then hit a routine ground ball to shortstop Brendan Donahue, but his throw pulled second baseman Mike Stovall off the bag and everyone was safe. Zach Levins then hit a sacrifice fly to give Staples the advantage. "Zach had a great at-bat," Wreckers coach Jack McFarland said. Darien had a chance to respond in the top of the fifth. Senior Sam Gillespie hit a one-out single to right, senior Alex Yergy reached on sophomore shortstop Sam Ellinwood's error and classmate Tommy MacLean singled to right to load the bases. Next up was senior Kyle Mangan, who pushed the count to 3-and-1, one ball away of walking in the tying run. Staples righty Jimmy Kopack had other ideas. He threw two straight strikes to register the out on Mangan, who didn't swing at either pitch. "I was working the outside corner the whole at-bat, and I worked it in to the last pitch and caught him off-guard," Kopack said. "It pumped me up and gave me confidence to throw." McFarland said, "That was huge. That's what seniors do, and this is why Jimmy is one of the five best pitchers in the league." Kopack then induced senior Tucker White to ground out to Ellinwood at shortstop to end the inning. "It's an opportunity you have to take advantage of, and we didn't have good at-bats [in these clutch situations]," Blue Wave coach Mike Scott said. "You can't let a team like Staples off the hook." The Wreckers began to break away from Darien in the next two innings. Junior James Frusciante led off the bottom of the fifth with a single to right field. Two batters later, classmate Eli Andrew roped an RBI double to right. MacLean tried to make a diving catch on it, but the ball went by him. "I had a tough last few games, and it felt good to have a couple of good at-bats today," Andrew said. "It was a fast ball down and away, and I got a good piece on it." One out later, senior captain Ben Greenberg roped an RBI single to right off the righty Gillespie, who relieved Dehlin after Andrew's hit. His single scored junior pinch-runner Matt Campbell. "He was throwing an outside pitch, and I tried to take it the other way," Greenberg said. McFarland said, "Ben Greenberg had good at-bats. I preach hit the ball hard and strong, and the team with the most hits [usually] wins. I'm happy with the way we tacked on runs." Levins led off the sixth with a single to center. Senior Matt Reynolds followed with an infield hit. After both runners advanced on a wild pitch, Frusciante plated them with a two-run single to right. Kopack pitched 6 1/3 innings and allowed three earned runs on eight hits with a walk and nine strikeouts. He allowed all three runs in the first three innings. "Jimmy took awhile to get comfortable, but he settled down nicely," McFarland said. The rain played a role as both teams took advantage of the conditions to score three runs each in the first 1 ½ innings. Once the rain stopped, Kopack and Dehlin settled down, but that changed for the latter after allowing the unearned run. "You could say the rain got to me, and it affected the field as well, but it was more like I wasn't making my pitches, and I got behind in the count," Kopack said. "I wasn't hitting my spots." Senior Bryan Previte led off the game with a double to center field. Previte scored on Kopack's wild pitch. Terzian hit a one-out single in the bottom of the first and took second after Previte bobbled it. Reynolds plated him with a single to center. After Frusciante walked, senior Marco Romero plated Reynolds with a single to left. Following a walk, Greenberg lined an 0-2 pitch to center for an RBI single. "I tried to keep it simple and treat it like batting practice," Greenberg said. Darien scored two in the second inning to tie it. "When you play a program like Staples, you can't give them extra chances because they will take advantage," Scott said. Staples is happy to be 9-1 at the midway point. "I'm really excited about it," Greenberg said. "Everyone has learned from last year's seniors. We have to get to 12 FCIAC wins in order to make FCIACs, 9-1 is a good start." Kopack said, "It's a really good start for us. There were question marks going into the season, but we proved ourselves. We have good pitching, our fielding is excellent, and we're starting to hit. We can compete with anyone in the league."